Over the last couple of days I’ve been reading (and loving) Joe Hill’s debut collection, 20th Century Ghosts. I suspect Hill – who also happens to be the son of Stephen and Tabitha King – isn’t likely be familiar to a lot of literary readers, which is a pity, because he’s a seriously good writer. While I’ve only read about half of 20th Century Ghosts, it’s one of those books which fairly hums with energy and intelligence. If I’m being honest about it part of what I like about 20th Century Ghosts is its subject matter. While I’m not suggesting for a moment there aren’t brilliant literary short stories being written, the literary short story (like the literary novel) feels increasingly mannered to me, a form distinguished by its careful, competent evocation of things we already know rather than the sort of excitement and danger I want writing to be about. That’s obviously a conversation for another day, not least because at least part of the pleasure of 20th Century Ghosts does actually lie in the sort of subject matter literary stories tend to explore, in particular the awkwardness and loneliness of adolescence. But while that’s sometimes that’s an end in itself – ‘Better Than Home’, for instance focusses on a young boy whose sensitivity to sound underlines the mingled tenderness and neglect that characterise his relationship with his baseball player father – more often that alienation is evoked through the incorporation of elements of the surreal, such as Art, the inflatable boy in the ominously-titled ‘Pop Art’. But the real joy of 20th Century Ghosts is its playful appropriation and subversion of the tropes of the Horror genre it inhabits, and more particular the pulpy, pop cultural version of it that arose in the 1950s and 1960s. This is most overtly the case in the collection’s thrillingly clever opening story, ‘Best New Horror’, which manages to work not just as a genuinely chilling horror story, but as a elegant and uncomfortably acute satire of the both the niceties of literary culture (“people … who dreamed heartbreaking dreams about one day selling a poem to The New Yorker“) and the sub-culture that surrounds Horror fiction (“sweaty little grubs who get hard over corpses”). As genres go, Horror is, of course, one of the more disreputable. Lurid, cannibalistic (in both senses of the word), often just gross, the very nature of its subject matter makes it uncomfortable and unpleasant reading. Yet its capacity to embody not just the deepest, most atavistic elements of the subconscious but also the most deep-seated anxieties of the culture it inhabits also lend it an immediacy and power more elevated forms often lack. Like SF it estranges by making metaphor literal, but unlike SF it also plays overtly upon the elision of the boundaries between life and death, human and inhuman, real and imaginary. 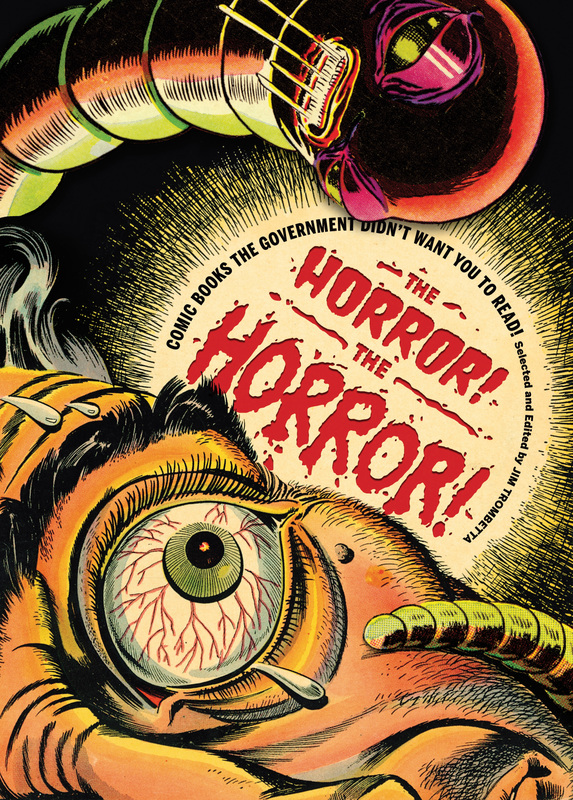 All of which brings me to another book I’ve been reading recently, Jim Trombetta’s lavish study of the pre-Comics Code horror comics of the 1950s, The Horror! The Horror! Given the last publishers abandoned the Code earlier this year, The Horror! The Horror! is a historical artefact in more ways than one: not just the anxieties and the culture they were embedded within have long since vanished, but even the moral panic that suppressed them has subsided, if only to be replaced by different fears. Yet it’s also a wonderfully vivid and often marvellously immediate portrait of a cultural form that flowered only briefly before being pushed underground. For me it’s also an exercise in nostalgia. Although I’m obviously too young to have read any of these comics in their original form, my childhood reading was augmented not just by the black and white reprints of old E.C. comics that could be found in Australian newsagents in the 1970s, but by several fabulous books about the history of comics my parents gave me as a child (the best of which, Les Daniels and John Peck’s Comix: A History of Comics in America is readily available in cheap second-hand editions via Amazon and AbeBooks). But either way The Horror! The Horror! is a delight. While Trombetta has some acute (if sometimes rather over-theorised) things to say about the social and cultural conditions that gave birth to the horror comics of the 1950s (the idea of the passion for zombies as a response to the Korean War was new to me, for instance) and the campaign to suppress them (Trombetta rightly points out that the same culture which wanted to ban the weird horror of kid’s comics was also explicitly retailing its own officially-sanctioned nightmares about nuclear war and Communist infiltration) he largely lets the comics themselves do the talking, reproducing not just a host of covers but dozens of stories in full. Viewed collectively it’s difficult not to be struck by the sheer energy and delight of the work on display. Partly that’s about the fact many of the artists and writers are ones who would go on to make their name as the architects of the Silver Age comics on the 1960s (the book’s magnificent cover is by the young Steve Ditko, who would go on to create Spiderman and Doctor Strange (who’s apparently getting a movie soon) with Stan Lee). But it’s also about the form itself, its fertility and openness to the charge of the forbidden and unsettling, and – something its detractors were right about – its explicit sexual overtones. Like the pulp fiction of the pre-war era the very nature of the industry, its speed, its dependence upon formula, allow the best of the work produced to mainline the deepest anxieties and fantasies of the culture it inhabited. All of which is a roundabout way of saying it’s a book that’s very worth tracking down (the edition I have comes with a DVD of Paul Coates’ famous 1955 report on the industry, though that report is also available online and is embedded below). If you’d like to know more about it you might also want to read Graphic Novel Reporter’s interview with Trombetta, or you can feast your eyes on the images in the promotional video below. Thanks for pointing out these couple of gems, and for the thoughtful discussion of horror. Genre is in the news, which is great, though I guess nobody with a stake in it expects much of the expectations and beliefs about genre to change regardless of how often the pooh-poohers demonstrate themselves to be ideologically and not artistically motivated. The horror genre knows that there’s much to be gained in terms of understanding people by examining what frightens them. Moreover horror, as I think you suggest, is a fantastic demonstration (or perhaps a distillation) of what attracts readers to genre fiction of all kinds: energy.